"Hall County is a county located in the U.S. state of Nebraska. As of 2000, the population was 53,534. Its county seat is Grand Island." - from Wikipedia. "Hall County is located along Interstate 80 in picturesque central Nebraska. We believe we enjoy the ideal blend of town and country life here in Hall County. With Grand Island as the 4th largest city in Nebraska we have ready access to all of the services of a bigger city while still being blessed with the bountiful natural resources that living in the country in the Platte Valley of Nebraska offers." 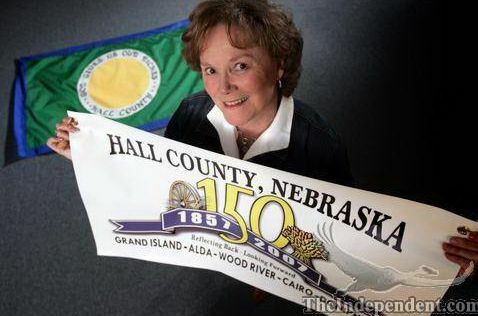 Hall county now has a common flag and a sesquicentennial flag. Both are shown on a photo at www.surfnebraska.net/gallery/041707/0417_CountyFlag_LH.